WATCH: Obama Dances The Tango During State Dinner In Argentina : The Two-Way The president initially declined but then accepted the outstretched hand of a dancer at the state dinner in Buenos Aires. The first lady also took the floor for the famous Argentine tango. President Obama and first lady Michelle Obama (right) tango with dancers during the state dinner in Argentina on Wednesday. While The Associated Press reports Obama initially declined the dancer's outstretched hand — multiple times — he then relented and joined her on the floor, dancing for about about a minute to the dramatic tango music. While we wouldn't say Obama was necessarily fleet of foot, the leader of the free world was able to hold his own on the dance floor. 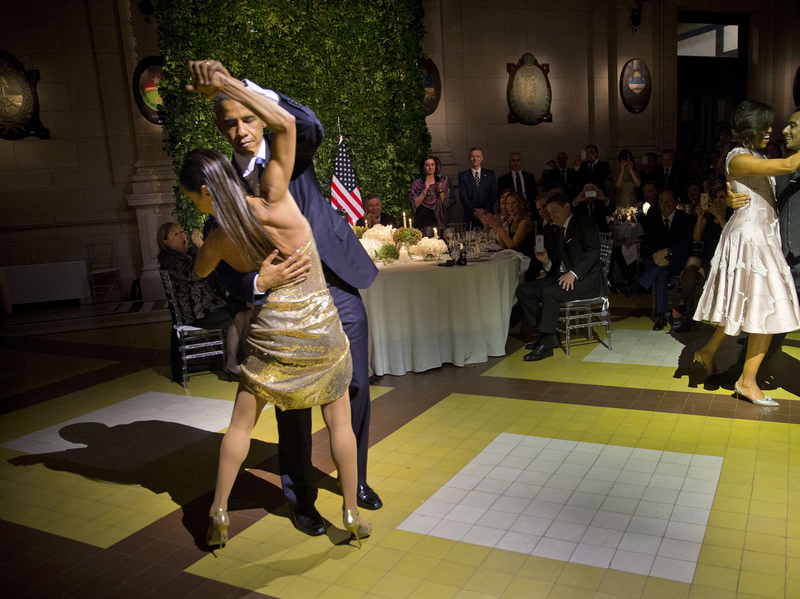 Nearby, first lady Michelle Obama tangoed with another dancer. After the dance ended, she and the president's partner exchanged a few words and smiles. Visiting the South American country on an official state visit, Obama has promised to declassify U.S. documents related to the dark period of Argentina's history called the Dirty War, in which the government killed or "disappeared" as many as 30,000 Argentines during a seven-year dictatorship in the 1970s and 1980s. As Michele Kelemen reported, Obama, speaking at a joint news conference in Buenos Aires on Wednesday with Argentina's president, Mauricio Macri, said: "We previously declassified thousands of records from that era, but for the first time now, we will declassify military and intelligence records as well." A previous version of this story contained a video with the wrong soundtrack.